Whether you've been leveraging social media from the beginning or are just now boarding the Twitter train into the forbidden forest of Facebook, it's time to get a handle on your social media efforts. With all the chatter, real-time updates and "Fail Whales" looming, managing a social media presence effectively can be a headache and a half. There are a few ways to tackle social media: in-house, through an outsourced agency or with short-term or ongoing consultants. If you've decided a full-fledged social media company doesn't fit your budget, there are some great and economical DIY solutions available to small businesses. "We use a variety of tools to manage our social media engagement, including Actionly, TweetDeck, Google Alerts and Hyper Alerts," says Stephanie Bullis of Grasshopper, a virtual phone system designed for small businesses. "The analytics that these tools provide allow us to better understand the social platforms that our customers are using most." Shel Horowitz, a green marketing consultant and lead author of Guerrilla Marketing Goes Green, says one Twitter tool in particular is helpful in extending his tweet efforts. "TweetDeck allows a lot of functionality lacking in Twitter's own interface: reply to all, toggling link-shortening on and off, editing retweeted posts and a feature that allows longer tweets than 140 [characters]," Horowitz says. "What this means to me is that I can spend 15 to 30 minutes per day for all social media together and still establish a meaningful presence and brand." See below for a quick rundown on what some of the latest social media management tools have to offer. TweetDeck allows users to add multiple accounts, including Facebook, Twitter, LinkedIn, foursquare and more. TweetDeck calls itself "the airport control" of Twitter. It integrates with link-shortening services and allows users to see multiple feeds and mentions at once. TweetDeck is free to use. HootSuite lets users manage multiple networks, schedule messages, develop custom analytics reports and more. HootSuite is free, but certain features, including reports, work on a point system. Users must upgrade from a free account to have access to all the site's features. With Sprout Social, users can organize multiple accounts and multiple identities in one place, schedule messages and measure success through reports. The interface is among the sharpest around. Sprout Social also has some cool tools for discovering new people to follow and engage. Packages range from $9 per month to $49 per month. Actionly is a paid social media monitoring tool that gives users the ability to create custom searches from which to pull data, track ROI and measure post-click conversations. It also facilitates the management of multiple social media accounts from its dashboard. Best of all, Actionly integrates with Google Analytics. Plans are $20, $50 and $100 per month. 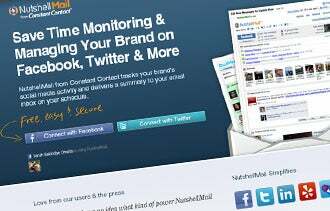 NutshellMail from Constant Contact tracks users' social media presence on a number of sites, including Facebook, Twitter, LinkedIn, Yelp, foursquare and YouTube, and delivers a summary via e-mail. It's a great tool for managing brands on a budget.